Round-Trip Flight Deals to Europe! Air Canada Air Canada Europe Sale: Round-Trip Toronto to Amsterdam from $703, Montreal to Dublin from $669 + More! Round-Trip Flight Deals to Europe! 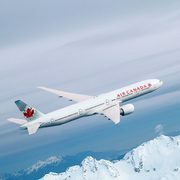 Head to the United Kingdom, France, Germany, and more with help from Air Canada's Europe Sale! Head online through April 16, where you can find deals on round-trip flights to locations across Europe! Note that prices can vary based on your selected dates and destination. Total prices displayed include air transportation charges, including taxes, fees and charges, as well as surcharges. Prices are live through April 16.